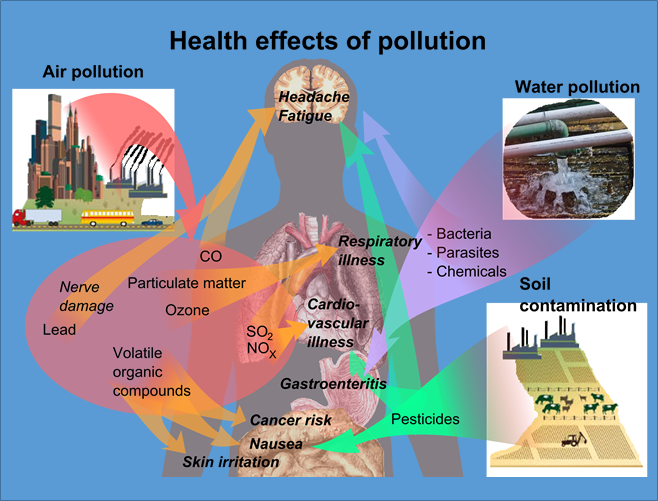 Environmental pollution is a global epidemic, which increases each year and causes horrible damage to our planet, and to our bodies. This makes living a healthy lifestyle more challenging, which is why we are advocates of a healthy lifestyle. The four types of environmental pollutants you should know are; soil, water, air, and noise. The most harmful pollutant is air. Caused by the smoke we create from our motorized vehicles, factories, burning leaves, and cigarettes, we emit carbon monoxide, sulphur dioxide, as well as nitrogen oxides. None of which are good especially when you want to live a healthy lifestyle. Air pollution has been linked to asthma, allergies, numerous breathing problems, as well as lung cancer, as well as irreparable damage towards fauna and flora. Migrating birds also find it more and more difficult to reach their seasonal destinations because of air pollution. Air conditioners, fridges, insect repellents and deodorants release Chlorofluorocarbons, also known as CFC, which severely damages our environment. Using natural products is always far better for the environment in general and for your health. Industrial waste leaked into our water bodies has severely damaged our marine life, and our drinking water. Hydration is essential to living a healthy active lifestyle. We cause water pollution through large scale dumping of garbage, ashes, flowers, and even household waste. Finally, surface run-off from non-organic farms make soil pollution affect our water. Drinking water is essential to life on this planet. When choosing bottled water make sure to choose a brand that is reputable. If you use tap water it’s recommended that you put it through a filtration system first before drinking. Soil and noise damage our environment as well. Aircrafts, street vehicles, trains, speakers, horns, and industry noises are all part of noise pollution, as is sonar effects of high-intensities. Motor vehicles may be great, but they cause 90% of the unwanted noise throughout the world. Peace and quiet are needed in order for one to concentrate and relax. You don’t want to be in an environment where the environmental noise gives you a headache everyday. Soil pollution from chemical fertilizer run off goes into our ground water, air born carbon monoxide, sulphur dioxide, as well as nitrogen oxide rain down and contaminated crops. This means getting health food becomes more difficult everyday we continue to pollute our environment. So keeping chemicals out of the natural environment is more important than we may have previously thought. Let’s keep heavy metals, herbicides, pesticides, hydrocarbons, as well as chlorinated hydrocarbons out of our environment. Keeping a clean environment around us is essential to longevity and a healthy life. So consider making greener choices in your everyday approaches to living. Eating healthy and exercising are a great start, but making sure that what you eat and the environment in which you exercise is clean is also equally important.